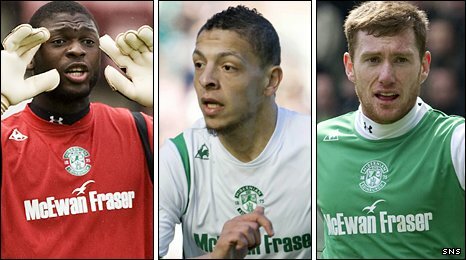 Hibernian have told Yves Ma-Kalambay, Abdessalam Benjelloun, Darren McCormack and Patrick Cregg that they will not have their contracts renewed. Belgian goalkeeper Ma-Kalambay has not started a match since the 4-1 league defeat by Rangers in December. Moroccan international Benjelloun moved to Hibs in 2006 but has recently struggled for first-team action. Midfielder Cregg failed to nail down a starting place, while defender McCormack made 10 outings this season. Cregg left Falkirk to team up with former boss John Hughes last summer but started just 10 games. Much was expected of McCormack, who was a transfer target for Celtic in 2007, but the 21-year-old has not progressed enough to impress Hughes, although attracting adverse headlines for his off-field behaviour may have contributed to his departure. Former Rangers forward Alan Gow has also returned to Plymouth now that his loan deal has expired. Gow, who also played under Hughes with the Bairns, joined Hibs in February but injury hampered his stay and it appears the club have decided against trying to make the move permanent. Hibs finished in fourth place in the SPL this season, clinching a Europa League qualification spot in the process.